The Central Washington Writers' Guild anthology Tales of Assassins is on sale for 99 cents this week (until Tuesday) for the Kindle version. They are a symbol of awe and wonder, a breed that defies the line between what is safe and what is dangerous, the characters genre fiction readers have fallen in love with generation after generation, whether they were kind and noble creatures or terrifying enemies. Enjoy eleven spine-tingling tales of murder, mayhem, and mystery by talented authors. The genres range from fantasy, science fiction, mainstream, and humor. It's a great opportunity to read a variety of authors and learn their styles. Oh, and I have a story in there, too. 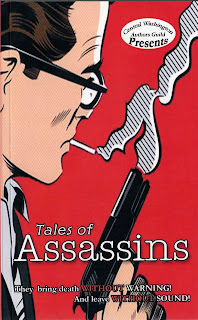 So while it's on sale (until Tuesday), get your Kindle copy of Tales of Assassins.